Theatre Severn is located next to the Welsh Bridge in Shrewsbury town centre. Shrewsbury is the county town of Shropshire. As England's largest inland county, Shropshire is easy to find! The county is situated between the West Midlands and Wales. Theatre Severn has a commitment through the Theatre Severn Travel Plan to encourage more sustainable travel. Please consider using public transport, cycling, walking or car sharing to reach us. Theatre Severn is located next to Frankwell Car Park where charges apply before 6pm only. For SatNav, please enter SY3 8HQ to locate the theatre. To find a car park and information on tariffs please see Shrewsbury Car Parks on the Shropshire Council website. Disabled parking spaces are available in the main Frankwell car park outside the Guildhall. From Welsh Bridge/town centre keep left and then turn left by the Darwin Community Centre. This takes you down to Water Lane; turn left again and cycle under the Welsh Bridge to reach the theatre entrance. From Porthill Road or Porthill Bridge pass the Boathouse Pub and then turn right down Water Lane which takes you to the theatre entrance. From Frankwell Island keep left on Frankwell and bear left at the lights, to approach the theatre from the north. 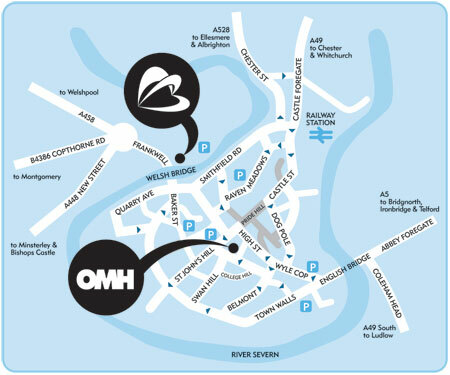 Wheelchair users and visitors with pushchairs should access Theatre Severn via Welsh Bridge. Frankwell footbridge is not accessible to wheelchair users or people using pushchairs due to the number of steps leading up to the bridge. For more information on the facilities and services offered to people with disabilities visiting Theatre Severn can be found on our ACCESS page, or alternatively please call the box office on 01743 281281 for further advice. Please visit National Rail or trainline for timetable information. Theatre Severn is located within a 10 minute walk of Shrewsbury Railway Station, along Smithfield Road and via Frankwell footbridge or Welsh Bridge. Coach parking is available in the Frankwell Car Park, adjacent to Theatre Severn. A flat, paved footpath leads from this area alongside the river to the riverside entrance to the theatre. To avoid traffic congestion coach operators are asked not to offload or collect from outside the Theatre Severn entrance. If you are attending a matinee or daytime show, Park and Ride services are available at Oxon Business Park, Meole Brace Retail Park and Harlescott. Monday to Saturday express buses to the town centre run every 10 minutes. The first bus is at 7.30am Monday to Friday and 8am on Saturday, with the last bus departing at 6.10pm. From the town centre the first bus is at 7.40am Monday to Friday and 8.10am on Saturday, with the last bus departing at 6.30pm. For Theatre Severn, alight at Barker Street, opposite Rowley's House and Frankwell Island is served by the Oxon service. The return bus fare is £1.20 and includes all-day parking. Accompanied children under 16 years travel free. People who wish to use the Park & Ride service but choose to walk to one of the three sites to catch the bus will be charged a 'walker' fare of £2.40 return. For more information visit: Park & Ride Services on the Shropshire Council website.